Click on book cover to learn more! 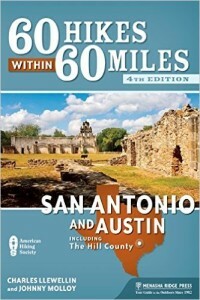 This book covers 60 great hikes in the greater San Antonio Austin area, with more hikes in the Hill Country. This is one of the most unsung and best hikes in this entire guidebook. After tunneling through dense woods, open onto tall bluffs overlooking Georgetown Lake. From there, circle around a stream to reach Crockett Gardens and Falls. Here, a crystalline spring emanates from a rock ridge, then tumbles over a bluff overgrown with vegetation alongside the falls. From exit 261A on I-35, Lake Georgetown/Andice, take Texas Ranch Road 2338 West. Travel west for 3.3 miles, then turn left on Cedar Breaks Road. Follow Cedar Breaks Road west for 2.1 miles, crossing the Georgetown Lake Dam along the way to reach the Cedar Breaks Park entrance station. Make your first left beyond the entrance station and reach the trailhead. Was this walk ever surprising and a hit from beginning to end and back! The hike encompasses a section of the Goodwater Hiking Trail, which makes a circuit of Georgetown Lake on U.S. Army Corps of Engineers and city of Georgetown land. The rich cedar woods made for shady hiking, then sheer 100-foot bluffs opened up vistas extending the length of Lake Georgetown. Beyond here, the trail circled a stream to reach an old homesite and Crockett Gardens and Falls. Here, I saw the springhead that flows a short distance to tumble over an unlikely bluff into Lake Georgetown. The rich vegetation around the spring run and falls is attractive and makes for a great picnic or lunch locale. Leave the large trailhead on a gravel path extending into cedar woods. At .4 mile, cross a small rocky ravine. The gravel has given way to rocks and dirt. Ahead, reach a marker of stone. This is Second Booty’s Crossing. In pre dam days this was a route used by travelers up the North Fork San Gabriel River Valley. Originally known as Russell Crossing, this was the second crossing of the North Fork San Gabriel River above Georgetown. The trail of gnarly limestone now makes a bluff line. Here, you can look across the lake at Russell Park. Reach the 1-mile post. Ahead more views open, extending the length of the lake. Walk to the bluff’s edge — some of the drops are sheer and 100 feet or more down to the alluring blue water. Continue along the bluff gaining more views. Pass through an old wire fence and open into a cactus, rock and grass clearing. Begin to circle around the embayment of an unnamed stream, passing the 2-mile post. Dip into the sycamore lined stream, quickly climbing out and to a clearing, where stone relics of an old homestead stand near a cedar post corral in varied stages of decay. Bisect the corral and reach a trail sign at 2.4 miles. Ahead is Crockett Spring, but turn right here toward the base of the falls. Jump over the streambed below and work around the lake’s edge on an old roadbed that now leads into the lake. You begin to hear falling water. Across the embayment is Crockett Falls. You can see the narrow stream stair stepping down a bluff. Lush vegetation lines the falls on its descent. Return to the main trail and reach the spring run and upper falls. Many a settler has coveted this area. It went through several hands until James Knight operated a flour mill and grew vegetables in the area, including the first strawberries in Williamson County. Later, R. M. Crockett, who gave the area its name, operated the truck garden. Crockett would grow produce and take it to Austin to sell. On the far side of the fence, outside Corps of Engineers property, you can see concrete foundations and outlines of buildings, as well as the stone house and corral relics nearby. Large pecan trees shade the spring run and benches. The outflow of the spring is visible near the base of a low rock ridge. The falls from above are quite a sight, too. It is easy to see why this is one of the most coveted spots in Central Texas. Cedar Breaks Park has a picnic area, campground and boat landing. For more information call (512) 930-LAKE or visit www.swf.usace.army.mil/georgetown.